There is no gainsaying the fact that the automobile industry in Nigeria has a potential to contribute immensely to the growth and development of the country’s economy. Many a country across the globe has harnessed the great imports of the industry to enhance the growth and sustainability of their economy. Notable amongst these countries include South Africa where automobile sector held a special place in their industrialization strategy. At the current state of the nation’s economy with numerous challenges, it is paramount for the new government to focus on the overall sectoral rejuvenation, economic strategy and trade policy. In view of the growing concern by stakeholder on the sustainability and possible review of the auto policy, the CEO of Kia Motors Nigeria, Jacky Hathiramani has charted a new course for the government and called on president Muhammad Buhari to address the key issues and lingering challenges in the development of Nigerian automobile industry. In his proposal, he posited on the germane significance of the industry and how pertinent it is for the new administration under the stewardship of President Buhari to bring to bear the progressive change it had instituted in its campaigns and programmes to the automobile industry. According to Jacky, one of the major challenges bedeviling the development of automobile industry is the staggering amount and alarming rate of used vehicles importations. He espoused that “for the industry to grow, the importation of used vehicles need to be addressed. Despite the business challenges it pose to the local manufacturers, the level of the economic menace it constitute cannot be overemphasized. The government needs to be steadfast in its pursuit of economy growth by tackling importation of used vehicles and also strengthening the border to drastically reduce the spate of smuggling into the country. When the administration addresses the influx of the used vehicles, there will be a corresponding demand for the new locally made cars which will create a mass production and in turn drastically reduce the prices owing to a resultant effect on the cost of production. He opined that, the thrust of the Nigeria auto policy needs to be restructured to further create an enabling environment for the local assembling companies. Taking a cue from developed countries where local manufacturers are given government aids and tax exemptions for Semi Knocked Down (SKD) parts and components from import tariffs, the current administration can further reduce or exempt local companies from import tariff which will go a long way in reducing the cost of producing the vehicle thereby reducing the prices and giving them a competitive edge. While lamenting on the current state of the nation’s power supply, he enjoined the government to revamp the power sector for adequate provision of energy to support local plants. The operational cost of an assembly plant in Nigeria today is high based on the epileptic power supply and the high cost of running power generators has continued to have effect on the pricing of Nigerian made vehicles. Jacky stated that adequate power supply is the fulcrum for sustainable economic growth. To make the locally assembled vehicles competes favourably and produce affordable vehicles to the teeming publics, the business environment needs to be conducive. The key initiative of the government should be centred on reducing the cost of doing business in the country. He stressed that the current administration needs to focus on pragmatic automobile policies – to drive growth and economic diversification. He stated further that the foreign automakers who are not partnering with local companies to establish assembly plant needs to be barred from operating in the country to help strengthen the local assembling plants. Most importantly, the government needs to encourage the local assembly plant owners by enlisting them in its fleet requirements and solely use vehicles that are assembled in Nigeria. As a developing country with a potential for economic growth, it’s of utmost significance to address the key issues in the automobile industry. Jacky stressed that the new political dispensation which rides on the goodwill of President Buhari offers a great opportunity to bring about the desired change in the economy and it’s important to immediately formulate investment friendly policies and embark on a trajectory growth of the economy through structural development of the automobile industry. There is the need therefore for the administration to establish a constructive and transparent policy to promote the development of local businesses. If the policies are well implemented, Nigeria will in no time supply the made-in-Nigeria vehicles to neighbouring countries and the country can move from consuming economy to a producing nation thereby ushering in trade surplus in the country’s balance of trade. With an unwavering commitment to bring to the fore an affordable made-in-Nigeria vehicle, Kia Motors Nigeria has featured highly competitive special offers on the most sought after B-Segment sedan in Nigeria with both the Big Deal of N1.98m on Kia Rio manual transmission and Mega Deal of N2.97m on the automatic transmission powered Kia Rio. The people’s car as it’s dubbed at the unveiling of the made-in-Nigeria Kia vehicles by the former Minister of State, Federal Capital Territory, Mrs. Olajumoke Akinjide, is built with remarkable features that exceeds customer expectations and has over the years remained the preferred option for teeming customers. 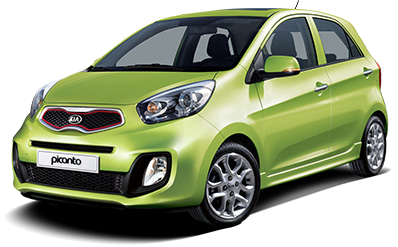 In line with its promise to provide affordable best in class cars to the Nigeria publics, Kia Motors Nigeria has presented an unprecedented great customer savings on its made in Nigeria Kia Rio. The offers are to reassure the customers that their interest is always edged at the core values of the company. To ensure that all lovers of the People’s Car benefits from this offers, the offer is valid while stock lasts. The Kia Rio is an extremely well-built car with innovative engineering, is low cost and fun to drive, and its interior is suitably comforting. Emanating flair from every angle, the Rio’s low, wide stance and short overhangs give it a strong, youthful identity all of its own. Kia’s designers have engineered a car with features that are cutting-edge yet at the same time effortlessly simple to use. A highly visible supervision cluster incorporates an on-board trip computer, while the steering wheel itself is tilt and telescopically adjustable so that you can find your perfect driving position. Switches are positioned for ultimate convenience – such as steering wheel-mounted controls for the audio system and auto cruise control. With minimal hand movement you can operate numerous controls without having to take your hands off the wheel. From a structural framework that absorbs impact forces in both frontal and side-on collisions to a range of active and passive safety measures, the Rio is built to protect those that matter. 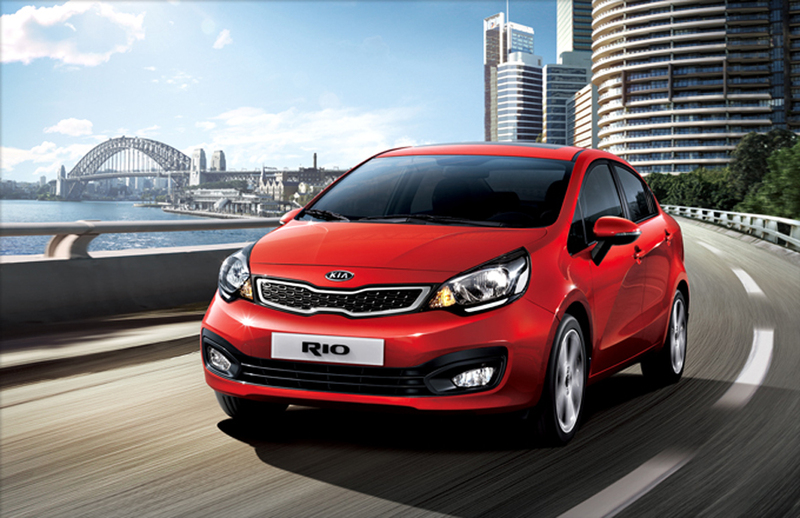 The Kia Rio and comes with high efficiency and performance, low emissions and reduced fuel consumption, not to mention safety specifications of the highest order. The ultimate expression of confidence in the Kia Rio body style is sure to impress with its dynamic stance and low-slung profile. Belying its invigorating looks, it offers the same fuel efficient powertrains, silhouette and clean, and distinct design touches that will make you stand out from the crowd. There’s no longer a need to compromise on style when searching for that perfect combination of comfort, economy and functionality. 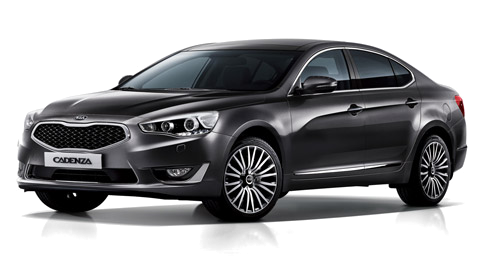 More than just a promise, Kia Motors Nigeria is committed to making driving a true pleasure for customers across the country with youthful and dynamic styling and the latest in advanced technology, Kia cars are turning heads the world over with the power to surprise. 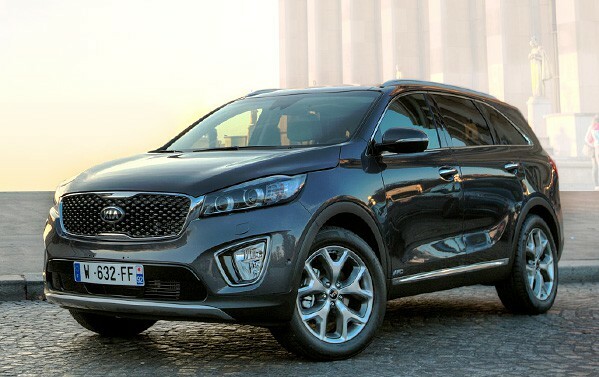 From the Picanto to the Mohave, Kia offers a full lineup of sedans, SUVs and MPVs that are not only practical and stylish but downright exhilarating to drive. Kia remains the most exciting force of change in the automotive world and is ready to change the way you feel and think about driving with affordable cutting edge vehicles. Chief Operations Officer, Adebisi Awoniyi and Bright Okpocha (aka Basketmouth), during the Kia Rio presentation ceremony for the competition. 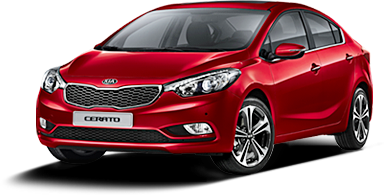 Kia Motors Nigeria, the leading Korean brand in the country has over the years been at the fore of urban culture with innovative and youthful designs of its best in class models. The company recently collaborated with Bi-Courtney Aviation Limited, owners of MMA 2 Airport to organise the first ever Instagram competition tagged MMA2KiaRace in Nigeria. The competition recorded a remarkable feat as over 2000 contestants participated for the grand prize, the Kia Rio dubbed the people’s car. The final competition was held on Saturday, 6 June, 2015 at the Murtala Muhammed Airport Two (MMA2), Lagos. It was both an exciting and intriguing ceremony where 20 finalists are to compete for the Kia Rio in the grand finale of the competition. The contest was anchored by one of Nigeria’s finest comedians and the brand ambassador of Kia in Nigeria, Mr Bright Okpocha (aka Basketmouth) who cracked the ribs of all the contestants and the audience with hilariously rich jokes. After a keenly contested game of intelligence, smartness and luck, a 23 year old Business Admin Student of University of Lagos, Ms Scarlet Gbemisola Shotade emerged as the lucky winner of the People’s Car, Kia Rio from the five finalists of the competition. The social interaction of both individuals and brands in the world has moved beyond the face-to-face communication to easier and digitalised platforms like the social media where people can interact with brands at the comfort of their homes. 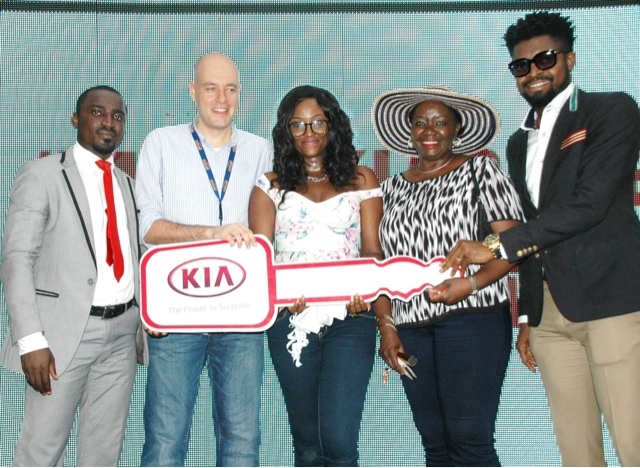 Flowing from this dynamics, Kia Motors Nigeria as a brand that is committed to connecting with its teeming customers has deepened its social media campaign with the partnership with Bi-Courtney to organise the Instagram competition. It will be recalled that Kia Motors Nigeria is the first automobile company to embrace the digital media particularly the ecommerce for all its transactions and interactions in Nigeria by listing all its models from Kia Picanto to Kia Mohave on the Konga.com platform amongst others. 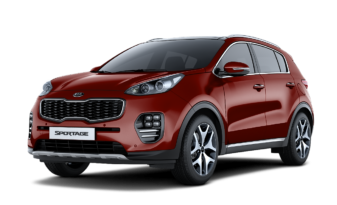 As a technology-driven company, that is undoubtedly at the vanguard of mobile and digital marketing, Kia Motors Nigeria has continuously key into the digital communication to save a lot of time and resources currently being expended doing businesses that can easily be conducted within the confines of its customers’ homes and offices. It is in view of this new age communication and the growing urban culture that Kia Motors Nigeria collaborated with Bi-Courtney Aviation Services Limited to organise the highly rewarding competition, the MMA2KiaRace. The competition recorded an outstanding success as other prizes like an Executive Suite and an Executive Double Room at the Le Meridien Ibom Hotel, Uyo, Akwa Ibom State, with free return tickets on Dana Air were won by the runners up. It was a win-win game for all participants as some other contestant won giveaways like fridges, Nokia Lumia phones, T.M. Lewin shirts, Levi’s sneakers, Swatch wristwatches and KFC’s meal vouchers.